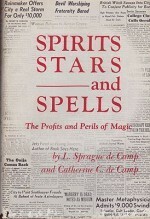 by: de Camp, L. Sprague and Catherine C.
Hardcover. New York , Canaveral Press, 1st, 1966, Book: Very Good, Dust Jacket: Good, Hardcover, 348 pages, b&w illustrations, price-clipped dust jacket with light edgewear. Clean copy.